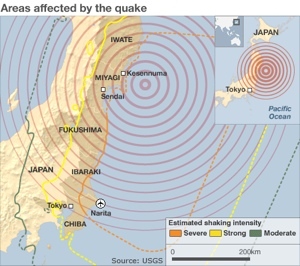 Japan’s most powerful earthquake since records began has struck off northeastern Japan this afternoon. The 8.9-magnitude earthquake triggered a massive 30 foot tsunami, swamping the Japanese shoreline, shaking Tokyo and causing fires to break out. According to the Geological Survey, the epicenter of the quake was east of Sendai and northeast of Tokyo. Even though we don’t live in Japan, this should be a wake-up call for all of us. Potential disasters can come to any of us at any time and we need to be vigilant and prepare for things that could affect us in our neck of the woods. Whether you believe that climate change is due to man or the sun, we should all agree that the times they are a changin’. Natural disasters are on the rise and more and more we are seeing Katrina-level events happening throughout the world. This, I believe, is only going to increase. We are now a tightly linked world. No longer can we observe foreign events with detachment. Events in one part of the world can intimately affect us as well. For example, this earthquake has shut down many oil refineries in Japan which will force them to seek for imports. Global suppliers, including refineries in California, may decide to go for the bigger buck and increase shipments to Japan instead of selling the fuel domestically, causing a bidding-up of prices. It’s events like this that should motivate you to start thinking. What potential disasters could occur in your area? Do you live near a fault line? How about near a dam or a power plant? Is your area susceptible to major winter storms or summer hurricanes? How about power outages and water shortages? Questions like these get your mind thinking about how best to prepare for the worst. It’s not negative thinking, it’s constructive thinking. If you’re a complete newbie, then I would recommend first getting your food and water storage in order. Major disasters (and even minor ones) cause disruptions in our fragile communication and supply-line networks. Having at least a 3-month supply of food and (depending on your area) water stored up will give you some major piece of mind when disaster strikes. I pretty much agree with your analysis, people should be totally self sufficient – but the reality will be most people will behave like sheep. The majority of people need a really strong personal wake up call, but for them it will be too late! Just been informed that there was a Nuclear Explosion spreading around in Japan. Yeah, we’re getting conflicting statements. Japan’s Nuclear Industrial Safety Agency (NISA) are saying that the explosion at the plant was caused by a meltdown of the reactor core. This conflicts with what the Japanese Chief Cabinet Secretary Yukio Edano said earlier that there wasn’t a breach and that it was under control. Thus may be the Japanese government trying to fleese the people.